Carlon's Curnow brothers leave the AFL tibunal. TOM Hawkins might be feeling a little hard done by after Carlton's Curnow brothers were let off with a fine, but that feeling might be short-lived. 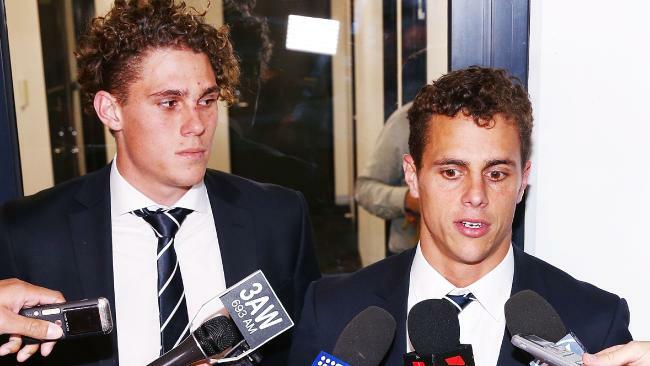 AFL football boss Steve Hocking still has the option to appeal after Charlie and Ed Curnow were fined on Tuesday night rather than suspended after being sent directly to the tribunal for making intentional contact with an umpire. 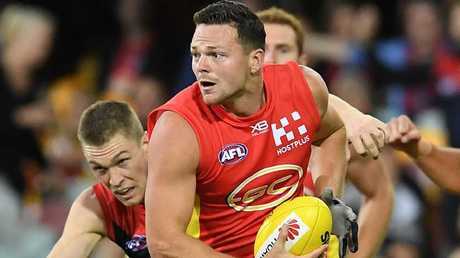 Their verdicts mirrored that of Gold Coast co-captain Steven May on Monday night. All three were charged with intentional contact with a whistleblower and successfully argued the charge down to careless contact and a $1000 fine. The bar for intentionally touching an umpire appeared to have been set at a one-game ban a week earlier at the tribunal when Hawkins was rubbed out for the same offence. 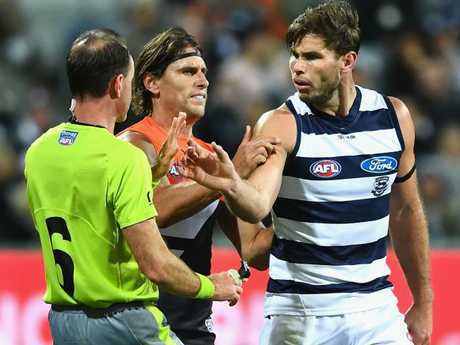 Unlike the three players who followed him, the Geelong spearhead took a one-game ban in a plea bargain-style deal after he was threatened with a two-match suspension for touching an umpire during the Cats' round-seven win over GWS. He's probably wishing he had rolled the dice after what transpired at AFL House on Monday and Tuesday night. Tom Hawkins accepted a one-week ban for touching an umpire. Just hours before May successfully dodged a ban on Monday evening, AFL match review officer Michael Christian made his position on umpire contact clear. "We have got to be really vigilant, especially in stop-play situations," Christian said. "I think the message is clear that you cannot make contact with umpires." After Hawkins appeared to cop his right whack for a momentary brain fade, the tribunal's decisions to let off May and the Blues brothers have blurred the line again. Interestingly enough, Carlton football chief Andrew McKay sat in on May's hearing the day before his players faced the music. The Curnow boys made almost identical cases to the tribunal. Charlie touched umpire Matt Stevic and Ed umpire Nathan Williamson during Carlton's drought-breaking win over Essendon at the MCG on Sunday. In similar statements submitted into evidence, both umpires said they didn't say anything at the time contact was made, neither felt threatened or had any issues with what had occurred. Ed Curnow had more luck than Hawkins and escaped any penalty. Both hearings took less than 30 minutes, the jury of Stewart Loewe, Jason Johnson and Wayne Henwood taking four and 12 minutes respectively to come to their conclusions. 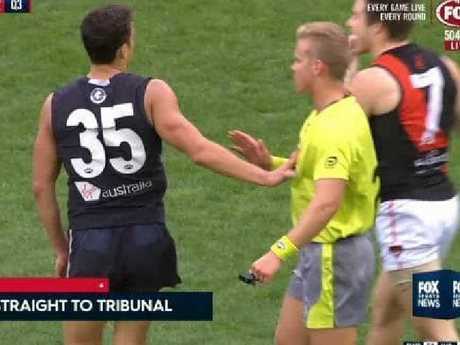 "I'd just like to say that we both highly respect umpires and their position in the game as officiators and their importance to the game at all levels," Ed Curnow said as he left the hearing. "We both understand the tribunal's decision and we respect the process involved." The pair are free to play Melbourne at the MCG on Sunday following the verdict. The decision was met with dismay in some corners of the AFL world. Former Hawthorn star Daniel Harford told RSN radio: "I think it's the wrong decision. He (Ed Curnow) should have been suspended. It's a real head-scratcher." Speaking on 3AW, veteran footy journalist Caroline Wilson said: "I thought the whole point of the Tom Hawkins decision was that you couldn't touch an umpire?" AFL 360 co-host Gerard Whateley said there's no way the decisions could stand without an appeal. "Steve Hocking has no choice, tomorrow morning, to appeal these. No choice," Whateley said. "The AFL owes the game and owes every level of football the chance to re-hear the case." However, Essendon legend Tim Watson was in the minority, supporting the call to let the Curnow brothers off. "I think the right decisions were made at the tribunal," Watson said. "I think the Steven May thing was right and I think last night was. If you study that, I think that's OK.
"You have got a conflict of views. "You have the AFL, which has one view about an incident, and then they send it up to the tribunal, which is full of former AFL players, who obviously have a conflicting view about the severity of decisions." North Melbourne skipper Jack Ziebell was cleared of a kneeing charge in Tuesday night's other case. The AFL match review officer offered Ziebell a one-game ban for kneeing Richmond's Reece Conca in the first quarter of the Tigers' hard-fought 10-point at Etihad Stadium on Sunday. The jury found the impact wasn't enough to warrant a report after deliberating for less than five minutes.